TANGERINE DREAM will be playing live on 8th NOVEMBER 2019 at SALA BUT in MADRID, Spain. We will be happy to meet our Spanish friends again! JULY 2019 at LORELEY in Germany. TANGERINE DREAM will be playing live on 15th MARCH 2019 at BAAD CLUB in GLASGOW UK. We are happy to meet our Scottish friends again! This year's keyword of the INTERNET FESTIVAL in PISA is: INTELLIGENZA. radio forum since decades. Now it\'s time to celebrate! All our DVDs are manufactured in PAL. Usually all players installed within a computer system (Mediaplayer etc.) will accept and replay this format. Even DVD stand-alone players will probably be equiped with a PAL replay section. Customers within the States or all countries using the NTSC standard should check their TV monitoring system if it has PAL playback facilities. THE QUANTUM YEARS - FIRST TIME LIVE. Originally Mr. Klaus Schulze, the well-known contemporary of Edgar Froese and pioneer of electronic music was invited to play in the Szczecin Philharmony (Poland) in June 2016, but unfortunately had to cancel the concert due to his severe state of health. So he suggested Tangerine Dream to perform in his stead, which the band thankfully accepted. The concert took place in a stunningly beautiful location within the framework of the SOUNDLab concert series. 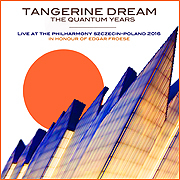 This special concert was the first official big concert for the three remaining TD members to perform live within the new period of THE QUANTUM YEARS, the period Edgar Froese, founder and head of Tangerine Dream until his death in January 2015, still had the chance to introduce in Australia in 2014. Thorsten, Ulrich and Hoshiko chose a series of well-known and popular TD tracks, but also came up with many new arrangements and some very new tracks from their QUANTUM KEY EP. Enjoy listening to a great live concert in Poland in a special atmosphere and with a wonderful audience. Dedicated to Edgar. QUANTUM KEY will be the vanguard of the coming QUANTUM GATE album which Thorsten, Ulrich and Hoshiko are currently working on. 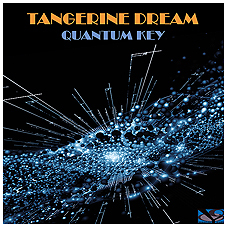 Edgar Froese, the head and founder of Tangerine Dream, had the wonderful idea of translating the current knowledge of the quantum physics - which he was very much interested in - into sound and already started this project before his sad death in January 2015. 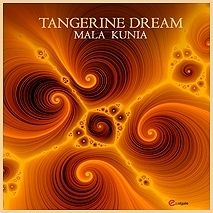 The cupdisc MALA KUNIA was the first music out of “The Quantum Years” series which was published in November 2014 on the occasion of the MMW Festival concert in Melbourne. It was a great fortune that Edgar still had the chance to discuss his vision with the remaining band members and that Bianca, Edgar's wife, decided to continue with Tangerine Dream. She knew that Thorsten, Ulrich and Hoshiko could face this huge challenge with their beautiful talents. At the same time this task would be a unique chance for the music coming into life. So the band continued developing these musical ideas after Edgar's sudden "change of his cosmic address" and you will have the chance now to listen to some wonderful tracks. In honour of Edgar! 20.000 miles from Vienna to Down Under and return. Enjoying a marvelous calm flight with Qantas and Emirates, crossing the outback and the rainforest up to Cairns very north of Australia. Alright, TD did again one of their little adventure tours. What does this all has to do with music? All and everything, because it does reflect our state of consciousness while traveling. The band’s new line-up, who gave their first concerts of ‘The Quantum Years’ Down Under, can be heard with the new bandmate Ulrich Schnauss. Of course it was too early to give ‘The Quantum Years’ musically the full speed. Also the final use of the new experimental technology, which is ready to go for Europe next year, could not have been completely set up because of some astronomical cargo costs. But please here is a little note for those fans who always want TD to invent the wheel the second time on each of their new recordings – we´re still humans! You will hear the big pipe organ of the Melbourne Town Hall played by Edgar and Thorsten, as well as some new instruments played by Hoshiko. The whole atmosphere will be different because of the new line-up, even if you will hear some of the well-known TD tunes. In addition to the two CDs containing the Melbourne Town Hall concert, you will find the third CD compiled of the best compositions played in celebration of the two ‘Sorcerer’ concerts performed at the ACMI Melbourne (Australian Centre For The Moving Image) in November, the most modern and soundwise really futuristic equipped cinema which exists in Australia. But that’s not all…… together with the three CD Set comes a Din A4 XL Booklet (as you already know from the Phaedra Farewell Tour) which will make you a travel and concert companion during TD’s visit Down Under. So join us and take a seat for a long travel to the other side of the planet earth. So much of new differently arranged and so-called “collector’s” compositions have been located at the Eastgate Studios within the last couple of months, so that the decision for the SEVENTH and LAST double CD out of the Booster series was made very easily. The Booster CD’s have been a kind of a corner stone within the TD community building some guidelines for those newbies who needed some help where to start discovering the various landmarks of TD’s work. Quite a reasonable number of newer compositions have also found their way into the public. But we do not want the Boosters become a racehorse within a series of titles all running against each other. Therefore decision has been made to stop with a last product which simultaneously has some of the best and rare TD compositions from all decades to offer – of course subjectively speaking. Relax, sit back and enjoy a little trip with the TD time machine through a well-known and sometimes strange musical territory. 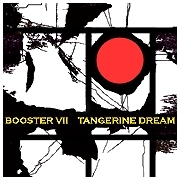 There will be at least FIVE new tracks on this BOOSTER VII. 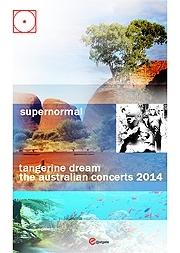 During Tangerine Dream’s Australian concerts in mid-November we will start shipping the first compositional work of the new line-up comprising Edgar Froese, Ulrich Schnauss, Thorsten Quaeschning and Hoshiko Yamane. It is the format of a so-called Cupdisc (EP) with a running time of nearly 55 minutes and the first product out of “The Quantum Years” series starting on 16th November 2014 with the MMW Festival concert in Melbourne. This cupdisc is named “MALA KUNIA” – the name of two Aboriginal tribes - according to Aboriginal mythology - living ages ago around Uluru, also known as Ayers Rock, whereas the Mala tribe lived on the sunny side and the Kunia on the shady side of the rock. This release will come as a limited edition because it’s just the overture to a bigger CD/Vinyl release in early spring 2015. SORCERER 2014 is the first live 2CD recording from our new virtual eastgate music & arts music theatre in Vienna. With the quality of a studio sound you will hear the remake of the original analogue version of William Friedkin's 1977 movie SORCERER. On the second CD you will hear material not used for the movie but which has a strong context to the analogue spirit of the time. If you couldn't make it to Copenhagen for the public world premiere, you will have here the virtual theatre version of the same music. Enjoy this adventurous travel with three trucks through the Mexican jungle. Finally - here it is: The one and only AUTOBIOGRAPHY of TANGERINE DREAM written by EDGAR FROESE himself, more than 500 pages, authentic, sincere and free-spirited - the extraordinary adventures of a band and especially its head and founder who were writing history together with their electronic innovations in a fossilized landscape of music in the seventies. 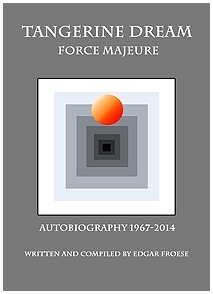 Edgar's narrative style in "FORCE MAJEURE" is very straightforward and uncompromising reflecting his 'storm and stress' period in the sixties. At the same time his language is humorous and picturesque - a language you are already familiar with from his musical compositions. This book is exciting from the beginning till the end even for people who don't know Edgar or Tangerine Dream. You will read quite a few never told stories as well as a straightforward correction of many rumours circulating among fans through the years. One chapter for example will exactly explain the split of work during the composing and recording process. Edgar will also give credit to those people who did help the band on various levels with their creative support and warm-hearted advice. So everything will come out of one hand – a big pioneering story about the suffering and longing of someone who started just to create some progressive sounds and ended up writing history. This autobiography does not only inform about a career of a band, but Edgar mainly provides an insight into his life, the life and work of his band, their numerous concert tours through the world, their thinking and acting, their inspirations, cooperations and conflicts. Some strange episodes with some colleagues who gave the band a hard time as well as hundreds of encounters and episodes with many interesting and well-known personalities like Salvador Dalí, David Bowie, Richard Branson, Brigitte Bardot, Andy Warhol, John Peel, Michelangelo Antonioni, Andy Summers, Jimi Hendrix, Kathleen Bigelow, Oliver Stone, Bob Moog, Stevie Nicks, Ridley Scott, William Friedkin, Michael Mann etc. - just to mention a few. More than 45 years on stage and 16 years of scoring in Hollywood have offered that much content and destiny that it could have been sufficient for two lives. Edgar is writing this autobiography for more than seven years now. The time has come to release it to the public and you will have the opportunity to realize this project by supporting your favorite band. EASTGATE will now start preselling this book in order to finance its printing and translation into English language (which will take about six months). The pre-sale also enables the EASTGATE team to estimate the quantity of the books to be printed and above all it ensures them their independency towards the publishing companies which are so far very interested in this project but with their own conditions. This would mean that they would automatically receive a right of co-determination which would destroy the book's authenticity. Edgar wouldn't accept this. All participants of the presale profit from a reduced presales price and the first 500 buyers will additionally receive a FULL CD of about 78 min length containing many new unreleased Tangerine Dream tracks including those three tracks of the special EP. This FULL CD will be signed and limited to 500 pieces. ALL buyers taking part in the PRE-SALE after the 500 full CDs have gone will nevertheless receive a SPECIAL EP with three new tracks until the day of the end of the pre-sale!! The book itself will contain another CD with some music and a special interview with Edgar, it will be made of a hardcover, will have more than 500 large-sized pages with many so far unreleased photos etc. etc. Another highlight: There will be a lottery among all presale buyers and 20 of them can win an invitation to the book release party. There will be a German and an English version of the autobiography. Later on we don't exclude to work together with a publishing company to release the book also in further languages, but the first edition will definitely be with EASTGATE. Afterwards the book and its content will not and cannot be changed anymore by publishers. THANK YOU VERY MUCH FOR SUPPORTING THIS SPECIAL TD PROJECT!! Projected release date: DECEMBER 2014/SPRING 2015 at the latest. If you have some questions with regard to the book, please send them to eastgate-book@gmx.com and we will answer them. Every 14 days we will post most of your questions and answers to our public FORUM. You will find them under the thread: "TD on HISTORY". ATTENTION: THIS BOOK MUST BE ORDERED SEPARATELY FROM OTHER PRODUCTS AS IT WILL BE SENT AT A LATER POINT OF TIME!! OTHERWISE POSTAGE WOULDN'T BE SUFFICIENT!